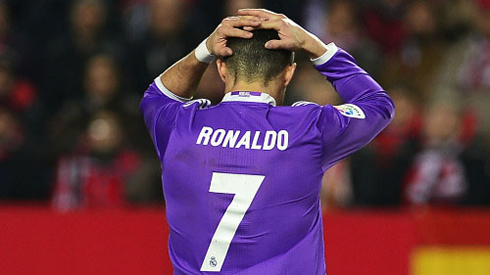 ﻿ Sevilla 2-1 Real Madrid. And the streak finally came to an end! 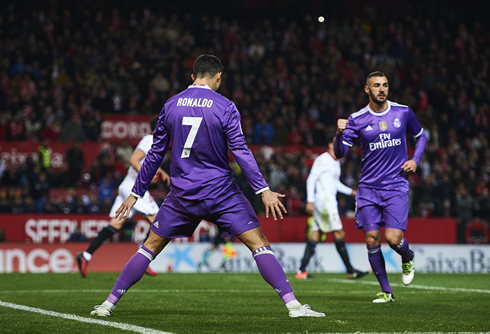 15.01.2017 » Sevilla 2-1 Real Madrid. And the streak finally came to an end! It was the 3rd time Real Madrid and Sevilla met in the past couple of weeks and this time around, Sampaoli got the better of Zinedine Zidane. The Merengues saw their unbeaten streak interrupted at the Sánchez Pizjuán, after losing 2-1 to the Andalusian side. The Sevilla trilogy finished today, as Real Madrid's 40-game unbeaten run came to an end against Sevilla, due to a last minute finish from Stevan Jovetic, who just joined the side this week from Inter Milan. His goal, coming in the dying moments of the match, allowed the hosts to grab a 2-1 lead and ended Madrid's fantastic streak. In practical terms, Sampaoli's men have now cut the league lead for the Merengues to a mere one point. Cristiano Ronaldo scored the only goal from his side, but a Sergio Ramos' own goal and Jovetic winner in added time brought the European champions down to earth. Zidane rolled out a 3-5-2 formation today, with Cristiano Ronaldo and Karim Benzema leading the line up in attack. Nacho, Varane and Ramos kept it tight in the center and with Casemiro protecting them, Real Madrid frustrated Sevilla time and time again early. Without his usual load of defensive responsibilities, Luka Modric was tour-de-force today, terrorizing the Sevilla backline time and time again. Still, Real Madrid struggled to put any serious chances together in front of goal and that basically allowed Sevilla to keep believing they could come out with a positive result tonight. The game opened up at times in the second half and in the 67th minute Real Madrid would go up 1-0 from the penalty spot. Capitalizing on a poor pass from the back, Dani Carvajal rounded Adil Rami before being upended by Sergio Rico. The keeper protested, but at the end of the day it was a clear foul anywhere in the world. 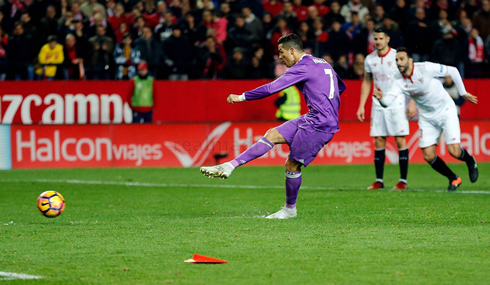 Ronaldo, who hadn't had a good game thus far, buried his penalty into the bottom corner before peeling off into his patented celebration. Some may be relieved the streak is over, now the team will not be under as much pressure to keep it going and can focus ahead on performing well for the rest of the season. But the fashion in which the streak was lost will surely leave a sour taste in the mouths of Madrid fans. Cristiano Ronaldo next game is a Copa del Rey fixture, on January 18 of 2017 against Celta de Vigo. You can watch Juventus live stream, Real Madrid vs Celta Vigo, Real Sociedad vs Barcelona, Plymouth Argyle vs Liverpool, Lincoln City vs Ipswich Town, and Torino vs AC Milan, all matches provided from our soccer live game pages.